Air horns are non-electrical devices that only operate from a compressed air supply. They offer very high dB output with very low frequency sound making them ideal for very noisy environments. Moflash offers an industrial and marine range. Being non-electrical they can be used in hazardous area Category 1 use. Bells are a cost effective traditional signalling device with a wide range of signalling applications. They offer medium dB output with a unique sound. Moflash offers two types: solenoid driven for industrial applications where they are under constant daily use, and a motor driven type more suitable for fire alarm applications. Either Electro Mechanical type where the diaphragm is deflected by a moving magnet which is triggered by a make and break contact of the Piezo type where the diaphragm is controlled by an electronic circuit. The Mechanical versions offer medium/high dB output with low frequency sound and are of robust construction. Piezo versions are relatively low dB and high frequency and are only suitable for local signalling applications. The Electronic Sounders are now the most versatile audible warning devices on the market today. With multiple tone & decibel selections these type of products will satisfy most applications with the added benefit of remote tone selection & voice activation. Hooters are powerful motor driven horns producing the unique and never forgotten ‘Klaxon’ sound used the world over. A serrated rotor driven against a hardened steel diaphragm stud creates a high dB output with low frequency sound. These types of signals are ideal for indoor and outdoor applications where a rugged and durable sounder is required. Sirens are powerful motor driven signals driving an internal impeller through a slotted cover creating a unique penetrating sound, traditionally recognisable for creating the ‘air raid’ warning signal. Note: This chart displays the theoretical attenuation in perfect conditions in an open area without obstruction. In addition, the sound frequency of the signal used will have a marked effect on the decibel reading at any given point. 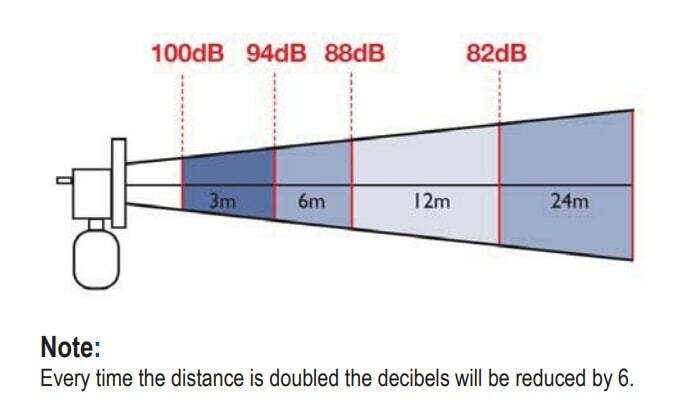 A much lower sound frequency will achieve a higher dB rating over longer distances (say +3dB against this table) than a much higher sound frequency (say -3dB).